Tubal ligation is surgery to tie the tubes (fallopian tubes) of a woman which causes permanent sterility by preventing transport of the egg (ovum) to the uterus. Tubal ligation may be recommended for adult women who are certain that they wish to prevent future pregnancies (permanent sterilization). Tubal ligation is not recommended as a temporary or reversible procedure. Tubal ligation is done in the hospital while the patient is deep asleep and pain-free (using general anesthesia). A small incision is made in the abdomen and a small telescope (laparoscope) is inserted. 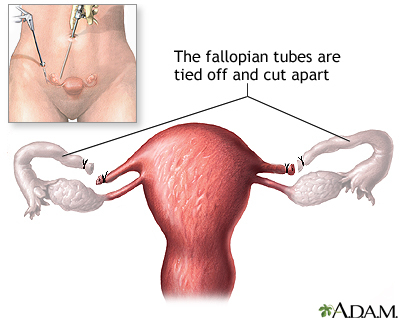 The tubes (fallopian tubes) are tied off and cut apart. The skin incision is stitched closed. The patient is able to return home within a few hours after the procedure. Tubal ligation can be performed immediately after childbirth.